Massive Minneapolis march repudiates Trump attacks on immigrants | Fight Back! Minneapolis, MN - As part of a national day of action on June 30 to #KeepFamiliesTogether, thousands of people poured into the streets of Minneapolis to march against the Trump administration’s attacks on immigrant families. The crowd was certainly larger than the police estimate of 7000, which is the number that the corporate media parroted. Some march marshals estimated 20,000, and one of the organizations that led the march announced the crowd size to be 30,000 people. The marchers in Minneapolis were determined to not only send a strong rebuke to the Trump administration’s policy of separating children from their parents after they cross the U.S.-México border, but to demand a complete rupture with the immigration policy of mass deportation and separation of families as it’s been built through successive administrations and now sped up to new heights under the authority of President Trump and Attorney General Sessions. 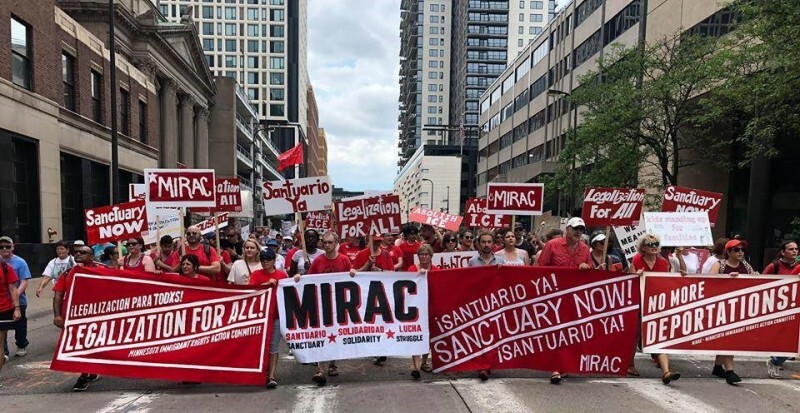 The Minneapolis march was organized by a broad coalition of immigrant rights organizations including the Minnesota Immigrant Rights Action Committee (MIRAC), Asamblea de Derechos Civiles, NAVIGATE, CTUL, Release MN8, and many others, who teamed up with statewide unions like AFSCME Council 5, SEIU Healthcare Minnesota and Local 26, Education Minnesota, and others. This broad coalition unanimously agreed to the demand to ‘Abolish ICE’ as well as to ‘Shut Down Sessions’ (referring to Attorney General Jeff Sessions) and ‘Free Our Future.’ Banners with these three slogans filled the streets showing that the march was not just about the separation of families at the border, but the policy of mass deportations and separation of families that Immigration and Customs Enforcement (ICE) has carried out since its inception in the xenophobic climate after 911. The large march began outside of the Minneapolis Convention Center where the national teachers’ union, National Education Association (NEA), was holding a national convention. NEA worked with organizers to encourage their members to participate in the march, and thousands came out of the convention center into the streets as a concrete demonstration of teachers’ commitment to standing alongside the children they’re dedicated to educating. The opening rally quickly overflowed the street outside the Convention Center and engulfed a park across the street, dwarfing the size that most had predicted would participate. Huge sections of the march never even saw or heard the speakers on the sound truck at the front of the march. Other than teachers from the NEA convention, one of the largest and most visible contingents in the march was the MIRAC contingent. The contingent had four themes: legalization for all, no more deportations, sanctuary now and abolish ICE. The group’s red banners, signs and shirts made a visual impression and made the point that the most urgently felt need among undocumented immigrants is for legalization and an end to deportations. Several unions and other organizations also had strong contingents. The march headed north into downtown Minneapolis to the Hennepin County jail, where Sheriff Stanek actively cooperates with ICE to deport people. There have been campaigns for several years demanding that Stanek stop cooperating with ICE, and demanding that Minneapolis city council stop working with Hennepin County jail if they continue to cooperate with ICE. Highlighting the role of Sheriff Stanek and the Hennepin County Jail’s cooperation with ICE was another way the march organizers made clear the issue is not just the policy of separation of families at the border, but rather the ongoing separation of millions of families throughout the country that has gone on for years and is escalating under the Trump administration. After going past the jail, marchers looped back to end again outside the Convention Center.